According to Pranav Haldea, Managing Director of PRIME Database, "Changes were made in as many as 178 NSE-listed companies from FY15 to FY16 and in 152 companies from FY16 to FY17". The analysis is based on auditors in all 1,520 NSE listed companies for the financial year 2015/16. Auditor rotation, as mandated by law, has picked up momentum. As per the data analysed by PRIME database for NSE listed companies, from 2013/14 to 2014/15, auditor changes were visible in 171 companies, from 2012/13 to2013/14 in 141 companies, from 2011/12 to 2012/113 in 141 companies, from 2010/11 to 2011/12 in 142 companies and from 2009/10 to 2010/11 in 141 companies. In line with the regulations around auditor rotation which kick in from April 1 2017, tenures of 99 auditors in 94 companies would expire in 2017/18, 172 auditors in 168 companies in 2018/19, 125 auditors in 117 companies in 2019/20 and 129 auditors in 127 companies in 2020/21. The Big four, namely Deloitte Haskins, SRBC & Co, BSR & Associates and PWC handled 401 assignments of the total 1,519 companies, or 26 per cent of the total. Their dominance was even stronger in the Nifty-500 subset where they handled 234 of the 500 audits or 47 per cent of the total. 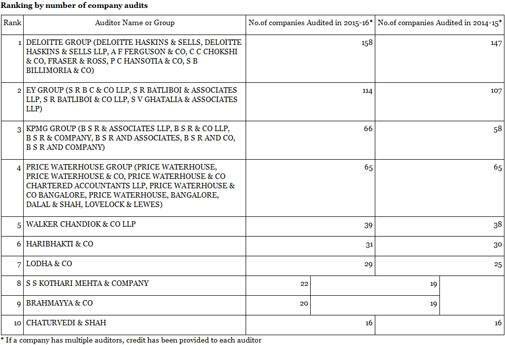 According to PRIME database, the top 10 audit firms accounted for audit of as many as 549 companies or 36 per cent of the total. Leading the league table was the Deloitte group with 158 companies, followed by EY Group (114), KPMG Group (66) and Price Waterhouse Group (65). On an overall basis, as many as 830 audit firms audited the 1,519 NSE-listed companies in 2015/16. This implies that, on an average, an audit firm audited 1.83 companies. The total audit fee paid out by companies was a significant Rs 1,900 crore (data based on 1,389 companies for which audit fee/total fee data is available**). This was an increase of 9 per cent from the Rs 1,746 crore paid out in the previous financial year 2014/15. The average audit fee was Rs. 1.37 crores. According to the analysis, the total overall fee paid out by companies was Rs 2,211 crore (data based on 1,389 companies for which total fee data is available). This was again an increase of 9 per cent from the Rs 2,025 crore paid out in the previous financial year 2014/15. The average total fee was Rs 1.59 crore. 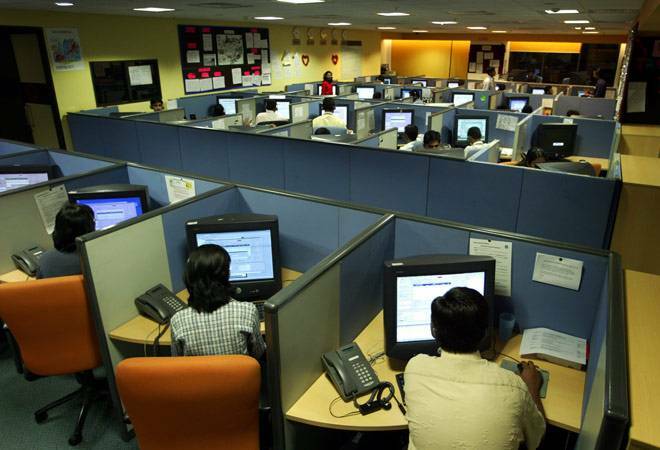 The Deloitte Group again led with Rs 333.67 crore, followed by EY Group at Rs 138.26 crore, KPMG Group at Rs 118.16 crore and PWC at Rs 71.39 crore. Audit fee as a percentage of total income earned by all listed companies was just 0.03 per cent among 1,368 companies for which the audit fee and total income data was available in comparison to 0.02 per cent last year.